San Mateo, pop. 91,000, is 15 miles south of San Francisco. Some of San Mateo's tickets can be ignored. If your "ticket" does not have the Superior Court's name and address on it, it is what I call a "Snitch Ticket." For more details, see the Snitch Ticket section on the Your Ticket page. In late 2015 there was a dismissal of nearly 1000 San Mateo tickets. See Set # 4, below. Sen. Hill hosts frequent events (Java with Jerry, open houses) around his district, which includes the red light camera cities of Millbrae, San Mateo and Menlo Park. For information about attending an event, see highwayrobbery.net's Millbrae Docs page or phone Hill's office at (650) 212-3313. If you will be boycotting San Mateo businesses, please send the following groups a little note. If you have a ticket from the City of San Mateo, be sure to contact me! who will be running for re-election in 2022. As of 2019 he still is in the State Legislature in Sacramento and is author of SB 246 of 2019 (if it passes it will add 10% tax to each barrel of oil). He was co-author of SB 1 which raised gas tax and car registration fees beginning Nov. 2017 and which was the subject of an attempted repeal, by Prop. 6 on the Nov. 2018 ballot. 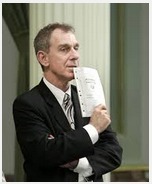 In 2013 he was the author of AB 666 which - had it passed - would have increased the number of red light camera tickets. This annual total was provided by the City. This annual total, annual projection, or average, is by highwayrobbery.net. The projection for 2018 is based upon Jan. - Apr. data. Except where noted otherwise, the figures given in the table are for the single calendar month indicated. 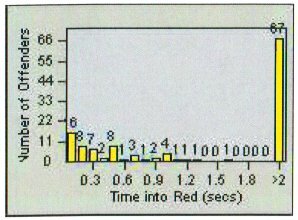 Any figures in red type (or, if you are looking at this table in black and white, the upper figure when there are two or more figures in a cell) are what RedFlex calls Total Violations, or all incidents recorded by the cameras. The figures in black type are what RedFlex calls Notices Printed, and represent the sum of genuine citations issued (those filed with the court) plus any Nominations mailed (not filed with the court, a.k.a. Snitch Tickets). Due to time limitations data may have been posted to the table only for selected months or locations. If there is sufficient public interest, the remaining months or locations will be posted. Full official data has been received and is available at one of the links given above. Data was requested on: 4-28-15. Entire year 2005 including November and December. Report (linked above) covers Jan. 2005 to Jul. 2010. In Aug. 2012 I received a Nov. 2011 memo which listed the length of the yellows. Those lengths have been entered at the bottom of the table, above. In June 2015 I received a Jan. 2015 memo which showed that the yellow for EB Hillsdale/Saratoga had been shortened. The shorter time has been entered above, in ( ). period may have been entered incorrectly. For purposes of averaging, the 2005 - 2012 report (linked above) has been treated as covering 90 months. Almost 1000 tickets from these months were dismissed, in late 2015. See Set # 4, below. May 2016 the city council approved a new contract adding enforcement to the two right turn lanes from eastbound Hillsdale onto Norfolk. See Set # 3, below. The report for this month was generated less than ten days after the end of the month, leaving a number of the Violations Recorded still "in progress." The Notices Printed figure shown for this month in the table above is our estimate of the number of notices eventually printed. sent to the City, go to Docs Set # 5 below. An official report showed that in 2016, 65% of the City's tickets were for right turns. The City of San Mateo signed its first contract with RedFlex in May 2004. The contract included a "cost neutrality" clause whereby the city would not have to pay RedFlex the full rent if fine revenue was insufficient to cover the cost. Following San Mateo's lead, many other cities adopted similar clauses. See Defect # 10 - B, on the Home page. The following invoice, for the month of Aug. 2005, shows what may be a cost neutrality adjustment, a "Performance credit" in the amount of $2412.00. The timing of it would be consistent with the 12-month review provided in the contract. In Sept. 2009 a defendant won his appeal on the cost neutrality issue. P. v. Bullock. In Dec. 2009 another defendant won his appeal on a San Mateo ticket. P. v. Schmidt. In Mar. 2010, another! P. v. Paul B. On Nov. 16, 2009 the city council voted 5-0 to renew the contract with RedFlex for another six years (staff report & contract) despite the fact that the original (2004) contract was not due to expire until May 2010. It is likely that the renewal date was moved up because the then-recent P. v. Bullock appeal decision found the original contract's cost neutral clause to be illegal, and the City wished to remove the clause without delay. The $17.9 million no-bid contract gave away a lot of money. One example: Under its terms (Exhibit D at the back of the contract document) the City agreed to pay $6200 per month for up to 20 newly installed cameras, for up to 10 years. Had San Mateo negotiated the same rate as neighboring Burlingame ($5870), the City could have saved $792,000 over ten years, on the new cameras. Another example: The City agreed to pay $4980 per month for the five existing cameras, for six more years. At that price the City still will pay $712,800 too much over the six years (when compared with a $3000 target price). See FAQ # 17. The contract contains an escape clause (Section 6.1) which allows the City to cancel the contract with ten days' notice and no penalty (once the cameras are more than 60 months old). In 2014, a number of the invoices from RedFlex to the City showed 20% discounts entitled "Allowance for other concession." When asked, the City said that there was nothing in writing about how those concessions came to be. Later, invoices from early 2015 showed that the discount was continuing, each month. But even with the discounts, the City was paying way too much. Consider this price schedule, from another city. In Nov. 2015 the SMPD submitted a one-page report recommending a two-year extension of the program at a reduced rent of $3985 per camera. In response, the city council asked for more information to be brought back to them in 90 days. In Feb. 2016 the SMPD asked for another 90 days. On May 2, 2016 the SMPD asked for another 30 days. The item came back to the council on May 16, 2016 and they approved it, 5 - 0. The contract amendment included adding enforcement to the two right turn lanes from eastbound Hillsdale onto Norfolk. San Mateo's cameras were nine to ten years old by 2016, so the target rent, per the Elk Grove schedule (above) should have been $2000, or less. Over the two years of the 2016 - 2018 extension the City will pay $238,200 extra. To cover that extra rent the City will need to issue 2382 extra tickets (the City gets about $100 from each ticket issued). On May 7, 2018 the council voted 5 - 0 to extend the contract for another two years, to June 20, 2020, with an option for two more years to 2022. There was no discussion, at all. They did not obtain a lower price. On Oct. 6, 2005 I asked the City of San Mateo for copies of its signal timing charts, both current and former. On Nov. 25 they provided charts dated May 25 for the signal at Hillsdale and Saratoga, and dated Sept. 14 for Hillsdale and Norfolk. I wrote them back, again asking for the charts that were effective prior to those dates. On Dec.7 the deputy city attorney wrote back that "the signal timing charts previously provided were as far back as available." If that truly is the case, the City will have a hard time proving that its yellows were long enough. Enforcement at Hillsdale and Saratoga started on May 19, so tickets between that date and May 25 could be challenged. Enforcement at Hillsdale and Norfolk started about July 28, so tickets between that date and Sept. 14 could be challenged. On Aug. 30, 2012 I received a Nov. 2011 memo which listed the length of the yellows. Those lengths have been entered at the bottom of the table in Set # 1, above. The info in Set # 5 is applicable throughout San Mateo County. Daly City, Menlo Park, Millbrae, and San Mateo. It is reasonable to expect that some or all of these cities will amend their contracts to remove the cost-neutral language. San Mateo, and Millbrae already have (see Docs Set # 6, below, and the Millbrae section on the Camera Towns page). Also in Dec. 2009 another San Mateo defendant (P. v. Schmidt) won his appeal, which was based upon missing warning signs and the control of the system by a private company. 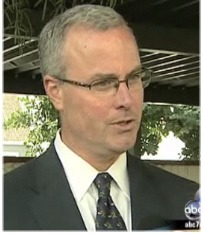 Then, in June 2010, a Millbrae defendant (P. v. Durney) won his appeal, based upon hearsay/confrontation (Sixth Amendment) issues. If you have a ticket from any of the cities listed above, please be sure to contact me! And contact your local reporters - ask them to write about this, get the word out. "Pleading guilty and asking for a reduced fine is fairly common when you attend court in person and they usually reduce it by around $100 [in San Mateo County]. Remote correspondence is also an option mentioned on the violation notice, but this option pertains to pleading not guilty. So in order to do both [pleading guilty and asking for the reduced fine, by mail], you need to send a letter (not email) to the traffic court asking if you can plead guilty with a reduced fine and attend traffic school. My fine was originally $490 plus $49 administrative fee for traffic school and it was reduced to $400 total (not including traffic school itself). I also used the San Mateo County website in order to extend my due date by one month to allow for enough time for the correspondence." If you are going to fight your ticket, you do not want to do it before Comm. Kathleen M. McKenna in the San Mateo courthouse. I strongly recommend doing a Peremptory Challenge to remove her from your case. See the Challenges page of this website. I also recommend doing a Peremptory Challenge of her if you are doing a Trial by Declaration. "Are we doing right by the public?" "I would advise cities who are contemplating installing red light cameras to move cautiously. I know these systems generate revenue for cities, but safety-wise there are questions about whether the red light cameras reduce accidents." "Based on the data provided by the cities, there was no overall trend indicating a noticeable change in accident rates before and after installation of red light cameras." "Recently, the City of San Carlos extended the yellow light time to comply with state standards and found that the number of citations fell dramatically." "As a result the revenue from red light citations could no longer cover the associated costs." In June 2010 the San Mateo County Grand Jury released a report containing the quote above. The grand jury rules allow the cities to make formal comments about the report, but do not allow the public to do so. Here is the final report (big file), including the initial report and the later comments by the cities. If you would like to read some grand jury reports about the red light cameras in other cities, see the Grand Jury entry in the Site Index. State Senator Jerry Hill: In 2017 Sen. Hill introduced SB 493 which, if it passes, will reduce the fine for a rolling right violation. Sen. Hill hosts frequent Java with Jerry events around his district, which includes the red light camera cities of Millbrae, San Mateo and Menlo Park. For information about attending a Java with Jerry event, see the info on the Millbrae Docs page, or phone his office at (650) 212-3313. The City provided bar graphs (or tables) of Late Times, etcetera, for all of its cameras. The San Mateo Police Department has a little bit of info about its program, on this webpage. RedFlex' construction work in San Mateo was the subject of a Prevailing Wage action by the California Department of Industrial Relations.